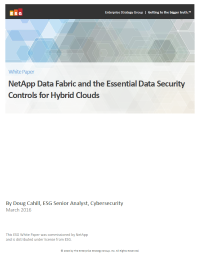 Download this Enterprise Strategy Group white paper to learn how a data fabric provides organizations with the ability to manage and secure data without losing the agility afforded to them through cloud computing. We live in a high-risk world as it relates to data security. The trends of big data, analytics, the Internet of Things, and new forms of intellectual property bring an entirely new scope to securing and managing data, while the move to highly-distributed, hybrid cloud environments brings still additional challenges to bear. Distributed and tiered storage, like those of cloud storage services, makes visibility challenging and so applying controls difficult. Still, trends suggest that more and more data is moving outside traditional data centre resources. How can organizations provide security controls given these complex challenges?